Jeremy and I have been busy riding, riding and more riding getting preparred for the NAETC 2013. The race would be only 15 mins from our farm in Florida, in the Goethe Forest with camp at the Black Prong Equestrian Center. Dust was having some big hoof issues. He is of French Arabian bloodlines and his feet leave a bit to be desired. Lucky for us Easyboot has just come out with the Easyshoe. We glued a pair of those onto Dust's front feet leaving his hinds barefoot and we were in business. Without those on his feet he would not have made it to the starting line this year. For the 5 weeks leading up to the championship Dust trained aggressively in his Easyshoes. Life was good. The best part was when we took them off it was clear that his feet were able to greatly improve while doing heavy training, that's a first!! On the 10th of October, 2011 (Columbus Day) Sea G Rhydr and Gryph Wulfkil left the Apple Farm in Philo, CA – heading out to rediscover America on horseback. Sea was riding Jesse James, who had served her faithfully all summer as her guide (and commuter) pony at Highland Ranch where she had been working as a trail guide. Gryph was riding Vaca Suerte and Saint Finehorn carried the pack. We followed the Navarro River West to the Pacific, said hello to the Ocean and turned our faces to the East. Preparing for a ride takes some thought...and some planning, and some loose arrangements. I have found that the ability to go with the flow has been the way to tamp down the preparation butterflies to a controlled flutter. The VA Highlands ride is a top notch ride not to be missed! I have had the good fortune to have ridden and finished it all five years. It just gets better and better. It is one of the more ‘challenging’ rides that I do. I would compare it to Leatherwood, another must do ride, that I have had to miss the last couple of years due to the date, which falls on same date of one or our DBDR rides. The South East has experienced a lot of rain this year...a LOT. And more than one ride has had to make camping or trail last minute decisions. It fell to Don and Nicki Meuten and their fabulous volunteers to that task, since the ride camp borders the New River. Fortunately, the ride was on! But, there was MUD...however, Tom Hagis and his golf cart got us all in there without a hitch. At least not that I ever saw...:) Four wheel drive is a good thing... He even got our little group parked together even though we arrived two different days..Thank you! Emma Orth, (our junior that has been helping us out all summer) and I loaded up the four guys on Friday morning. (Jeremy would not be joining us, as he was going to do a big triathalon training weekend with his brother.) Emma and I were heading to the Mendocino Magic, 2 day ride. We took Kings Gold, aka Elvis and Erebus for the first day 50 and Gold Dust Rising aka Dust and Most Likley (this is how you really spell his name) aka Mo for the second day. The drive was uneventful in the semi truck, although driving the big truck on the road from Willits to Ft Bragg, (hwy 20), was like trying to ride an elephant on a single track. We got there without any issues. After setting up we checked in and then vetted and pre rode the day 1 horses. I would ride Erebus and Emma would be on Elvis. It was very foggy but not cold. Mendocino is very beautiful so I was really looking forward to the rides over the weekend. It would also be my first race with Emma who has been helping us ride all summer. After the ride it was just about time for dinner. We headed over to the potluck, which had way too many great choices, and found familiar faces to eat with. It was great seeing all of my West Coast friends. To begin at the beginning, last Thursday Scrappy and I did our toe touches and neck stretches, loaded up in the packed truck and trailer, and hit the road for a 5 hr drive over to the coast to the 2 day, Mendocino Magic endurance ride. We had a relatively uneventful drive, in that my truck and trailer performed fine, but we were following J over and her rig and her parent's had a bit of passing trouble. Still we all arrived Thursday afternoon at various times and settled in. I grew up in the area this ride is held and made plans ahead of time to meet family. J and co were kind enough to Scrappy-sit for me so that I could dash out Thursday night, shower at my brother's so I didn't kill my very horse-allergic sister, and meet the family in town for dinner. Everyone was very tired but we chatted and stared off into space companionably and were all off to our various bed's before long. No horsing around, endurance riding is tougher than it looks! WITH some experience of the equestrian world, I thought I had a good idea what endurance riding was all about, but an afternoon at Trawsgoed Farm near Abermagwr showed me I had a lot to learn. Beth Jones, secretary of the mid and north Wales branch of endurance Great Britain, which is based at the farm, had just finished marking the start and finish of the 22km route when she told me that endurance is more than just a long hack. “Competitive rides start at around 30km, for which you’d be hoping to ride at around 12km per hour,” Beth explained. “When you turn up at the ride, you have to present your horse or pony to the vet, who will carry out a general health check. “On long rides, there will also be a veterinary check up in the middle of the ride. This requires careful calculation by the ridealtr - you can’t than just aim to complete the course as quickly as possible. Riders set off from the yard at a speedy trot, but the event I took part in was just a pleasure ride. Experienced endurance riders Sally and Wendy invite me to join them. I’m riding Beth’s horse Cisco. She’s 22 and has been taking part in endurance rides for a number of years. We set off from the yard and before I know it we’re trotting down the farm track and into the forestry. Last Wednesday Bill and I and my horse Zanie (FYF InZane+) left on a journey to the 25th annual Vermont 100 endurance ride and run. After doing the ride with cracked ribs last year (thrown from my youngster 2 weeks before) I was looking forward to a much easier time of it but as we know there are no easy 100s!! Just the trip up there was a feat of endurance, the temperatures climbed to over 100 degrees in Pennsylvania as we drove for about 9 1/2 hours from North Carolina. We stayed over at a nice horse hotel just over the NJ border where Zanie had a pasture and run in shed. Another 6 ½ hours the next day and the heat was still high, even when we arrived at the ride camp in Vermont. We had taken Zanie off to rest and graze several times during the trip and she came off the trailer looking great. The area had been receiving way too much rain and the camping fields were muddy but ride management managed to tuck everyone in somewhere. We were happy to find ourselves camped near several other friends from North Carolina, Mike and Ruth Anne Everett, Vic Stine and Leigh Ann Pauley. We totally baked in the heat setting camp until a big storm came and cooled things off a bit, although it blew things around camp and made the fields even more slippery. The next day Ruth Anne and I took a warm up ride and our horses were getting along very nicely and seemed very well matched in pace. We made a decision to ride together as long as it was working for both of us, if not we would split. We both have the same philosophies of pacing and we both wanted to go home happy with a completion. Riding as a team sounded like a good way to share a good time and help each other along the way. Our husbands Mike and Bill could help each other out with the crewing too. We got our horses vetted in and headed over to the runner tent to check out the scene and get some t-shirts. Later at the ride briefing it was discovered that several of the hold and pit crew areas had been changed at the last minute due to the wet weather. The weather report for race day was to be in the mid to upper 80s with 60% chance of severe thunderstorms. It would be a bit cooler than the previous days, but still quite hot, especially with the extremely high humidity. We would have to be careful and not let the heat build in our horses. We had another big thunderstorm in the night that broke up our sleep. The 3:30 feed time came all too soon and as the runners were leaving out at 4AM there were fireworks shot off from across the valley to celebrate the 25th anniversary. Another round of fireworks for the horses at 5AM and the 100 mile riders were off down the road. Ruth Anne and I settled near the back at the start so as not to get caught up with the front runners After a mile or two on the road we headed single file onto a dark woods trail as the sun came up , the horse in front of us was cantering and Ruth Anne’s horse, Jax, was getting a bit excited on the narrow trail so we backed off and tried to get some space. About this time we started to catch up with the slower runners. We broke out into some fields and then eventually to a paved road that took us right into the town of Woodstock. After we crossed a big steel bridge we had a 10 minute stop and go hold at mile 14 at the Billings Farm Museum parking lot and our crews were there to meet us. Zanie and Jax were relaxed and even ate a few bites and drank. We continued down the paved road out of town and turned onto some gravel roads past some beautiful New England farms. The scenery was just like a movie! Our first vet check hold at 19 miles was in an open field at Galaxy Hill Farm. Vic and Leigh Ann arrived shortly after we did and looked like they were having a good ride, they had no crew but seemed to be handling it. Our horses recovered immediately and we wasted no time getting to the pulse timers and the vets. Leigh Ann was not so lucky as her horse had developed a bad rub from the clip of an Easyboot she was carrying in her cantle bag. Sadly she decided to pull so as not to make it worse. After she returned her horse to camp however she switched gears and crewed for Vic for the rest of the ride who then hooked up with Dawn and Dean Hilliard so her horse would have some company. Jax and Zanie were pacing well and we took turns taking the lead as we headed down a dirt road after leaving vet check one. We turned into the woods and started climbing on a steep jeep trail, which soon broke out into open meadows. This was the place they call “Sound of Music Hill” where the Sound of Music was filmed (I think). We took our time through this section of beautiful open vistas and took advantage of the meadow grass to graze our horses while we enjoyed the view! It was so beautiful to watch the runners and the horses climbing and descending through the fields against the backdrop of the Green Mountains. It is said that this is one of the highest points on the course at 1,946’. I took lots of pictures here! After leaving the high point we had a really steep descent for a couple of hundred yards where the horses had to hunker down and slide on their butts down the slippery, muddy trail. We also encountered several challenging bogs throughout the morning, making slow going. In addition to the vet check holds there are a number of designated pit crew locations throughout the course where your crew can meet you with supplies. Also along the way the local folks put out water tanks for the horses and some even offer to hose your horse off which was most welcome in the heat of the day. Runners aid stations offer fruit, drinks and other goodies along the way so you are never far from some kind of support. At this point in the ride we start realizing that we keep passing the same runners over and over again. They do not have mandatory holds so will pass us only to be overtaken again later when our hold is over. This developed a comradery among the runners and riders. When we rode through one of the designated crew areas for the runners there would be people lining the road for almost a half a mile and they would clap and shout “good job riders! !” Some even had cow bells, it was like being in the Tour De France!! It was 23 long, steep up and down miles to Vet Check #2 at 42 miles, which had been changed to the GMHA (Green Mt Horse Assoc) parking lot because of mud at the original location. There were 2 pit crew stops in between at 34 and 38 miles where Bill and Mike were able to meet us. They were a welcome sight when we turned onto Grassy Lane after a tough 15 miles. We hung out for 10 minutes or so and recharged the horses and ourselves. It was late morning but the sun was getting hot already. Since the horses had drank and eaten well and it was only 4 miles down the trail we decided to have the guys skip the next pit crew stop and go right to the hold at GMHA instead which was only 7 miles away. We had a lot of challenging trail on this section but then we came out onto a paved road for a short way and across a real Vermont covered bridge. Jax wasn’t too sure about it but Zanie remembered it from last year and walked across with no hesitation giving Jax courage to follow. A spectator took some pictures of me and Ruth Anne with my camera for us, it was a real tourist moment! We caught a good view of the river before continuing up on some more steep gravel roads. We started to regret our decision to skip that pit crew spot! We took time to graze the horses several times who were getting hungry. We finally made it to the vet check and the boys were happy to see us as it had taken more time than we had expected to cover that tough 7 miles. There was lush grass at GMHA and Bill and Mike grazed the horses the whole time while we took care of ourselves. The next hold at “Mitchells” at mile 60 was 19 miles away and this leg turned out to be our low point of the ride. It was reaching mid afternoon the temperatures were rising. There was a stiff breeze but it was like a blast furnace drying out our horses and our selves. I couldn’t drink enough and I was developing a slight headache. There were long boggy sections where we could make no time at all and a long uphill road in the open sun called Agony Hill for good reason! The horses were taking it slow and conserving in the heat of the day, it seemed like we were just inching along. A pit stop seven miles in was well needed. Later on the rider trail deviated from the runner trail onto a woods path and we thought that it was the trail to vet check #3. It went on for several miles and was boggy the whole way further slowing our pace. When we came out to a gravel road we realized that we were not there yet. Things started to seem like they were changing for the better when a light rain started to fall, cooling the air to a comfortable level until the sky decided to open up and dump on us. I got my raincoat out but by the time I had it on I was already drenched. The wind got cool and I worried that it might chill our horse’s wet muscles so we tried to maintain a trot as best as we could with the challenging terrain. The shower only lasted about 20 minutes and it cooled things off but we were drenched to the bone and still weren’t to the vet check yet. We started to question if we had missed something back a ways. There were no ride maps so I did not have a visual of the course or even a written description, only my dim memories from last year and it felt like we should have been there. We were on a gravel road but had not seen any street signs for a long time so we were a bit disoriented. Ruth Anne had the smarts to ask a runner what the mileage on her GPS was and she said 60 miles. That was a relief as our next hold was at 60 and the runner’s mileage is a little different than ours since we have different stops. We came to an intersection of Puckerbush Road and I remembered that from last year so I knew we were close and that the vet check would be on the left. We were so glad when we finally saw it! It had taken us 3 1/2 hours to cover that 19 miles and I thought that wasn’t bad considering all the obstacles we encountered. We had ridden it as smart as we knew how, trotting where we could and walking where we had to and allowing the horses to graze along the way. The heat and the mud had slowed us down but we were still making steady progress. The horses were looking good and getting all As on their vet cards, we were doing a good job. It seemed to take forever to change out of my wet clothes in the front seat of the pick up truck, my tights sticking to my wet legs when I tried to pull them off, putting on a dry pair was no easier. Dry socks felt like heaven and so did a dry pair of boots. We were refreshed and ready for our trek to the next vet check. It was a short leg of only 10 miles and was mostly dirt roads so we decided to pick up the pace just a little. By now we have figured out that Jax likes the roads and Zanie is best on the technical trails so we would put the best horse for the terrain in front, Jax led most of the way through this part. We came through another big runner crew area and got the cheers again with some people recognizing us from earlier in the day. Those folks really know how to party, a bit further down the trail we came to an aid station called Margaritaville where they serve margaritas (mostly to the crews I would guess). We rode through some high dollar farms and past Tuacknback where the vet check is normally held on an expansive green lawn but due to the wet weather it had been changed to Spring Brook Farm just down the road. A lot of folks had trouble at this vet check as it was just at the end of the hottest part of the day and the horses were showing signs of stress. There were several pulls and they held my card because the vet thought Zanie’s gut was a little slow. She had been eating great all day but we had not taken the time to graze on that shorter 10 mile loop and were now paying the price. Back at the truck Zanie was eating like crazy and I wasn’t worried about her gut at all. We later re-presented and she passed just fine. As we left Spring Brook Farm the sun was getting low in the sky and we knew we were over the worst of the day and looking forward to the night riding. We rode through some beautiful woods trails and some fields with the setting sun peaking through the trees and the nearly full moon rising in the sky. It was a beautiful moment I’ll remember. The horses had picked up energy and were eager to move forward. A bit of trail and some more roads and we came to a pit crew stop at Smoke Rise Farm, Steve Rojek’s farm, which we rode through after our men crewed for us. The owls were hooting and some other bird unknown to us was calling as we rode into the darkness. The next crew stop was another 5 miles down the trail and was right near the ride camp and we thought our horses would think that they were finished but after that you turned away and did 22 more of some of the toughest miles. Zanie remembered the course from last year and readily turned away from camp without a moment’s hesitation. The horses were picking up energy with the nighttime and we made sure to stop and graze periodically to keep the energy going. Jax would lead on the roads and Zanie would lead in the woods, we worked like a team, it was unspoken. The horses were becoming stronger and stronger. We came on some other riders, the first we had seen in many hours, but their horses were tired and we went on by. The moon was high and beautiful by the time we rode into O&H Farm for our 5th and final hold. Zanie was back to all As on her vet card and was looking great. My headache was gone but I hadn’t been able to eat in a while and was fearing for my stomach. The hold was only 30 minutes and soon we were ready to go back out and finish it up we were told that we were in 5th and 6th place and that gave us some incentive. “Take me home Zanie” I said and we set out for our last 12 miles. We climbed and climbed and climbed some more but the horses were strong and they offered to trot up the hills at least part way, they could feel the pull of camp. On the flats (what little there was!) they cantered and trotted. At one point my stomach started to feel really bad, we had followed and then passed a bunch of runners who were wearing red blinky lights on their backs and it had made me feel a little woosey for about a half an hour. Then we came to a woods trail and I put Zanie in front, we both remembered this turn as the trail to camp, I felt better. We passed a sign that said one mile to go and we knew we were going to finish this thing! The last mile was really rough and washed out and you had to be really careful, one bad step here and all dreams will be shattered. We were so close, we would be careful. About 100 yards before the finish line we came around a corner ran smack into #3 and #4. Our horses were ready to pass but we held them back, no racing allowed at this finish line, too congested with people and horses. We accepted our place and happily tied for 5th. Ruth Anne smiled at me and said, “it’s just nice to know how close we had come to the front and that we rode the perfect ride!” “Yeah, I know!” I said and it was the perfect ride! We saw a lot of great scenery, met a lot of great people, took great care of our horses, paced a good great and came in looking great! What could be better? So I'm laying here on the bed with a small glass of wine & Tirzah at my feet formulating in my mind the last 2 days of my life and how I want to post. I know if I drink any more wine, I will be pretty useless for the remainder of the night and it's only 6:04 pm. Blogging will then wait til tomorrow if I fill up the glass again as that is a fact. I'm not sure how to write what an incredible experience I had without sounding trite. I found myself flying between a huge smile on my face, to tearing up at horses and people, to laughing uncontrollably because I was blessed to get the best vet on earth to scribe for. And, I don't say this lightly, because any vet here at this 58th Running of the Tevis Cup would have been the best vet on earth. I just think Carter and I were like a 7 & 7 (and don't ask me who was the Seagrams 7...) Or a wild ride thru the Granite Chief Wilderness on an perfectly trained arabian. No, ya'll ~ a crazy arabian that you just had to love no matter how crazy the horse was or how fast and reckless you were going.... It was just so frickin' fun I am probably going to go into a serious depression this week coming up. I am planning on riding again next year with Aura, but the next time I don't ride, I want to scribe again for my vet. It had been a long time since I’ve been to the Wild West ride. I went in 1999 and 2000. I remembered that it was a nice ride and the only reason I went so long inbetween attending it is because of scheduling conflicts. This ride is now a month later, so it worked out really well. 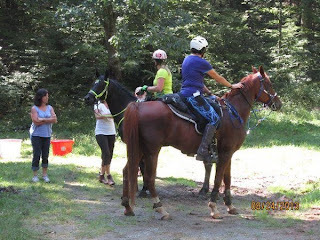 As you can see from the photo of my horses on the trailer, that we are backed up pretty tight in the trees. It’s a great camp, and I find it totally amazing at how many rigs they are able to fit in like pretzels around the pines. I rode Bo on days 1 and 3, and Chief on day 2. We had a great time on all of the days and really enjoyed all of the fun singletrack trail in the forest. It worked out really well for us, since the vet checks on day 2 were all out of camp. Chief does so much better when he is ‘out all day’. Bo is starting to get that way and I think that I am going to have to accept that this is what happens with my horses when they get a lot of experience. They have sure been spoiled by doing point to point rides and one big loop ride out of camp all day. There were two vet checks each day on the 50. We had to pull tack. Fortunately on the out vet check day, Brian was there and helped out. It was great getting to visit with him and catch up as we so seldom see each other. We’ve ridden a lot of miles together and always have fun remembering all of the great adventures that we’ve shared. 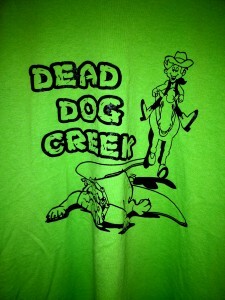 It was so fun that Brian even thought to wear his Rocky does Tevis crew t-shirt from 1999! Off we went about 15 min. after the start with a little anxiety of the unknown but excited to get started with my husband and I heading and healing. It became apparent this horse was about as good as it gets and can she trot. The sight of this little child and this 15h horse going down the trail like nobody's business is a memory I will never loose. We had a nice finish of 4h 20min.with all horses looking good at the final vet check. After the final trot out Austin told the vet (Anna) and all the others at the check he would see them next year. He took care of his horse and then returned Aries to her trailer. The rest of the day was spent jumping off one of our horses back in the lake, swimming in the pool and climbing the rock wall. What better 1st. Endurance ride could a child or adult for that matter have! We got in the truck to go home the morning and out of the blue he announces he is proud he finished his ride . I cannot say enough of how this memory got better except that the ride management, volunters, old friends and new friends were his cheerleaders for the whole day and thrilled to see this boy complete a very important day in his life and be apart of it. My husband and I are very lucky to be a part of this group. The 2013 Eagle Extreme Endurance Ride was certainly extreme as there appears to be a heat wave passing through setting record high temperatures. I heard it was 93 which for May 11 is pretty dang hot. It wasn't a big turnout, 3 on the 75 and 15 on the 50 miler with 15 on the 25 mile LD. A lot of trail riders came for the day too. I was riding Blue with my friend Tamara Baysinger. Tamara was starting her new horse on his first 50 and I had said I'd take Blue along to keep her company. Always helps a green horse to have an experienced trail buddy. Our first loop went out through the sagebrush and we climbed up to the edge of Rocky Canyon as the sun was coming up. It's a couple hundred feet deep and has the notoriety of being a murder site a few years back when a guy pushed his wife over the cliff. Her friends put up a cross in her memory. Deja Vu!! Back in Oreana, ID at the Tough Sucker ride in April. The only difference was in 2012 there were 4 entries on the 75, this year there were two. Sad but I really wanted to do the 75. At least I had someone to ride with, Trish Frahm and I were riding it together. Last year Thunder and I did the whole thing by ourselves. With the help of a little blue pill, I had a great nights sleep the night before the ride. Both Judith and I set our iPhones for 4:30 am so we would be ready for pick by Dr. Jim Bryant at 5:20. We were actually awakened by room service at 4:45 (thank goodness we had ordered breakfast). Since the time difference is 12 hours, and our phones have been in airplane mode so as not to accrue charges, the phone time was was 4:30 pm. With all our clothes laid out and gear ready to go, we had not problem meeting Jim at the appointed time. We were at the venue by 6:00 am. Soon the horses appeared and were hand walked for 30 minutes. About 10 minutes before the start we mounted and Jordi, Julien and I lined up in a row and did a little trotting and cantering. Pete remembered his dressage and was able to give me some leg yield and shoulder in, to help supple him before the start. Juma had us wait behind the start gate for 10 seconds after the start of the ride, then had us leave at a pace of 23.5 kph.